In Brief: Professor given powers over the earth by unknown forces, just out to do some good in the world. A tall man seeming to be in his late twenties to early thirties, Tarrant's quite fit but not overly muscular - he looks more like someone who spends a lot of time outdoors than someone who hits the gym five days a week. Short brown hair tops a strong, charming face with amused green, gold-flecked eyes. Left to his own devices he trends towards simple, durable clothing (jeans, simple t-shirts or button-ups, unadorned jacket), but dresses up a bit more for teaching (button-up shirt, vest, tie, and slacks). No matter what he's wearing, his footwear is practical - when asked, he generally offers something vague about personal comfort and the stride of his walk. 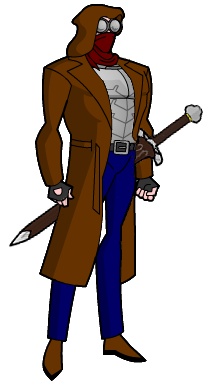 His heroing gear seems serviceable but a little slapdash: black fingerless gloves, heavy brown boots, dark jeans, dark red cloth over his mouth and nose, and a long brown hooded coat. Only three items are truly notable: first, a dull metal platemail chestpiece under the coat, apparently designed with an eye towards flexibility; second, a pair of round goggles completely obscuring his eyes; and third, an antique-looking but well-cared-for sword which never leaves his side. Power Descriptions: Gaian Knight leverages the abundant nearby earth for his effects, moving or reshaping it to his own ends - attacking from various angles to surprise his enemies or strike from around cover. As a hobbyist sculptor he takes a bit of pride in the appearance of his creations, and while not flamboyant he always adds his own artistic touches when able. As his power is instinctive and rooted to his being he doesn't need to gesture or invoke his magic, per se, and he's perfectly capable of directing his attacks with both hands in his pockets and both feet firmly on the ground. Still, a little dose of dramatic hand-movement now and again doesn't hurt one's focus. His powers often causes a noticeable earthy-golden glow that becomes more and more apparent as he takes larger and larger actions, starting around his hands, then his eyes, and finally his whole body (and any rock nearby). Though he rarely notices, long-term use of his power leads to small rocks orbiting him or following him around through the air. History: Young grad student Tarrant McLeod lived a pretty ordinary life up until a friend of his - an archaeology student - called him up to help with a huge, unlikely cave they'd unearthed near an old ruined city. Upon entering and touching a distinctly out-of-place pedestal of polished stone he was transported to an unknown, seemingly endless plane of earth where a floating vision of a woman in flowing robes spoke to him in broken sentences and half-formed images, part of some ancient recording or ceremony; she called him the Gaian Knight, charged him with protecting "the sword", and implied the purpose of this place was to empower a defender for the surrounding city when it was at the height of its grandeur. When returned to the cavern he found he'd been linked into the earth: he could feel the stone around him, shape it, move it. He also found a sword and scabbard on the altar where there had been none and, unconsciously compelled to take it with him, made his way back outside more confused than enlightened. Since then he's spent quite a bit of time learning to control his power, and took advantage of his new abilities and intuition to complete his schooling in record time. Offered a teaching job at Freedom City University, he finally feels like he's in a place in life where he can apply what he's learned...in more ways than one. Personality & Motivation: Tarrant is, at his core, just a fundamentally nice person; the boy scout, the nearly-literal salt-of-the-earth type who genuinely likes teaching and helping others. This is arguably his greatest strength as a hero - the ability to believe in others, to trust in doing the right thing, to have the conviction to take a third option when the options presented are terrible - but it also leaves him somewhat naive and overly-trusting. He isn't stupid, mind you (he is, technically, Doctor Tarrant), and he's too experienced to set himself up for a knife in the back, but he fundamentally wants to believe that people are fundamentally good, and that isn't always a safe assumption when confronting villainy. Given the option, Tarrant will always do what's right, even if it isn't easy. He's friendly, affable, and unimposing with a noted dislike of violence, but anyone who tries to push him too hard is going to find out that he's as much mountain as man when he needs to be. Powers & Tactics: With his determination and power-reinforced body, Tarrant tends to be the proverbial immovable object in a fight: he won't walk heedless into danger, but if necessary he will stand and take his licks while giving as good as he gets. He's an experienced hero but no master strategist or tricky fighter - he tends to fight as simply and as effectively as he can while minimizing the outright damage he's doing to most opponents and the environment. Honor (Chivalry): Respect and honor; he's not an old-school knight, but nevertheless tries to hold to a code of behavior that isn't always to his advantage. Tarrant is unlikely to pick a fight without threat of immediate danger, he leans toward inaction if too unsure of the negative consequences, and he's quick to offer clean surrender or a chance at someone's redemption. Responsibility: Professor. He tries to arrange his schedule (and the assigned homework!) as best he can, but he does have students to help and classes to teach. Teleportal: Tarrant's portals require an anchor: he can only create a portal to somewhere he's already set up a special anchor stone, usually in the form of an archway. No anchor, no portal - and destruction of any anchor prevents him from opening a portal to that location until he can get there some other way to fix it. Time and Tide: Tarrant isn't immune to aging, exactly - even the greatest mountains erode over time. He does, however, age very, very slowly - sufficiently powerful aging effects or the like will affect him, just far less than they might otherwise. A handful of small islands floating above the surface of Earth-Sanctuary. The largest, central island has a very nice castle, of all things. A platform on the ground offers a gateway to transport others to an island-based entry courtyard. An old and modestly ornate masterwork sword. In Brief: A dragon stuck in the modern world, with a chance at a clean slate and a society with fewer torches and pitchforks. Tall and fit with dark red hair and red eyes, few would disagree that Teagan is attractive, but not the sort of attractive one finds on a runway or the cover of a magazine; where willowy supermodels may look like they'd be blown over by a strong wind, Teagan Delphyne is better described as the strong wind itself. Powerful and imposing features built on a well-muscled frame, she wouldn't look terribly out of place in a suit of armor at the head of a medieval army...which is something she's likely well aware of, as when fighting crime she dons a dark grey and red chestplate and cape over dark red pants and sturdy boots, her hair pulled up and her identity nominally hidden under a simple domino mask. When she changes to her true form, though, she looks like the thing the army rides against: large and awfully powerful, a European-style quadrupedal horned dragon straight out of myth and legend. Her hide runs dark like coal along her underside but a deep crimson everywhere else, a tyrannosaurus-sized creature of razor teeth and rippling scales and terrible glory. For all her savage beauty, the intelligence behind her slitted red eyes mark her unmistakably above a common beast. Teagan's powers are typically either subtle or inherent to her being - the major exception to this is her fire breath, a directed storm of billowing dragon's fire, changing in hue and intensity with her mood and need. When changing shape her personal belongings disappear, clothes and mace simply lost from existence until she changes back. Though she's reluctant to use it, Teagan is no slouch at magic: given the time to set up, she can invoke the Old Words to work a ritual to meet her needs. Once upon a time there was a dragon, living in a world where magic had never quite been traded in for science, and where the populace knew that dragons were something to be feared and destroyed, lest they destroy cities and eat livestock...or worse. And that's precisely what dragons did, too, out of desire or pure necessity: difficult to gather together when your species is so competitive, and nigh impossible to blend into human society when the magic that offered you human form left you marked with a symbol of what you truly were - and a dragon's glory is not so easily hidden from a wizard's eyes. It was simply the way of things. It was how Teagan was raised, and it was how she lived, until one day she encountered a dimensionally-displaced heroine from a far-away place called Freedom City. They fought, of course, but even a mighty dragon isn't prepared for modern technology; her last waking memory on her home was hitting the ground and assuming that the nearby peasants would take advantage of her weakness and finish her, once and for all. And then she woke up somewhere very different with a very strange man waiting nearby. He smelled of earth and old magic, and patiently explained that this may have been the way of things, but circumstances had offered her a new way: a clean slate, in a new place, full of strange people and powers. A place where she could blend in, if she wanted. Where her kind was the stuff of unbelieved but fondly-remembered legends, where - if she chose, and wanted it badly enough - she could be respected, not feared...or at least, only feared by those worth being feared by. Where every day could be something new, and interesting, and carry fights to remember. Teagan is proud to the point of egotism, and she can be more than a little brash and hot-headed, but with a new chance and a clean slate her heart's in the right place. Helping people - and having them thankful to be helped! - is both novel and deeply gratifying, and the ability to fight truly worthy battles is the delicious icing on a treasured cake. She's loyal to a fault (if you earn that loyalty), enjoys a good challenge (and generally respects those who give her one), and she's willing to stand her ground, no matter the cost, for a worthy cause. She is, in general, a far better and more intellectually-minded creature than she cares to let on. She has a lot to learn about her new world, but she's not as thick-headed as she'd like to appear: she learns quickly, and looking foolish or out of place hurts her dignity enough that she puts real effort into trying to fit into modern day America. No matter her form or the battle, her strategy is pretty straight-forward: hit it until it stops fighting back, and then stop hitting it. She's a little too used to being able to win by pure, overwhelming force, but she's a cunning and experienced fighter coming from a lifetime of conflict. Said lifetime has taught her that sometimes you have to hit them when they're down - striking at a weak enemy is not dignified, but leaving your enemies to stab you in the back as soon as you run around isn't wise. The angrier she gets the more ruthless she's likely to become, falling more and more on old habits and lessons learned from deadlier foes. Ex Nihilo: As far as the rest of the world is concerned, Teagan didn't exist until a matter of years ago. She has some amount of official personhood on record now, but it doesn't take enormous effort to realize she sprang up out of nowhere. Funny Glowing Noise Boxes: Teagan's adjusted well enough to modern life, but where she's from they didn't have 'computers' and 'cars' and 'cell phones'. With experience she can mostly navigate the basics of modern life, but don't ask her to do anything fancy. +16 STR, +8 CON, +10' Movement, -2 Combat Modifier, +8 Grapple, -8 Stealth, +4 Intimidation, +10' reach, +10 Effective Carrying Strength. A heavy, unadorned steel mace with a leather-wrapped handle and a hanging leather loop. Its spherical head is studded with blunt spikes. This is the full - and, barring any minor tweaking and fluff updates, final - rebuild for Gaian Knight and Tiamat, maxing their allowed PP and bringing them up to full PL15. As it isn't entirely trivial and required some obnoxious trade-off balancing, especially on Tiamat's part, I'm submitting it as a full sheet review. You're spending 10ep on the HQ features but only have 9ep written (Totals and math is correct just needs the number fixed) I think flight is covered under isolated unless the intention is he can fly it around to different parts of sanctuary. Area on Burrowing effects the area people have to be in for you to grant them the power not the size of the tunnel. I think you just need progression to make a bigger tunnel/bring more people in your tunnel (You might be better off giving him a others only immunity to heat/pressure/suffocation(underground) for bringing people along. I will admit it has been awhile since I looked in depth at burrowing but thats how effects others swim or flight would work. Tremorsense should be 1PP for ranged on your base tactile sense IIRC Unless it adds something that he can detect that normal people can't detect by touch. I'll see if I can tackle Tiamat after food and stuff tonight. Traded out 2pp of Wis for 2pp of Int. Dropped Power Attack from feats to free 1pp. Fed 1pp to Saves to get Will back up to +12. Dropped two ranks of Perform and one rank of Sense Motive to boost Concentration, Notice, and Sense Motive up to compensate for the Wis loss. Good thought on the Flight; it isn't like it's supposed to be a helicarrier, and he can stunt a massive Move Object if he ever really needs to. I've dropped it for a Portal power to let non-GK, non-fliers up there if need be. Selective's weird on Portal, but I went with the extra rather than the feat regardless. Burrowing's weird with Affects Others. Explicitly, the +1 version lets you bring others with you at your pace while you burrow (the +0 just gives other people the power to burrow!) - I've noted in the power that I'm using the +1 version, not the +0 version. You're absolutely correct that he can't take anyone too deep - or with too little air supply in the tunnel or 'bubble' - without incurring potential negative consequences. Less of an issue than with Swimming, thankfully. Same deal with Area on Burrowing - the Burst Area lets you create a bigger tunnel. The Move Object is indeed strictly moving earthen objects. The first revision of his 250pp build had a second, lower-ranked power that better-represented grabbing things with earth arms (Move Object, -Perception, -Limit, +Damaging just to eat the pp); I'm fairly tempted to put it back into place if I can skim the pp from somewhere. Steal a little bit from less-used skills, maybe. Tremmorsense is 2pp because it's 1pp for the additional sense within the Tactile sense type, and 1pp for Ranged on that new sense, as noted by our house rules. If we want to eliminate the 1pp surcharge on new base senses, we should probably update that house rule to match. EDIT: On review I have indeed put the less-limited Move Object back in there; I ate 4 skills points (2 each of Knowledge (Arcane Lore) and Climb - GK's getting lazy with all the flying!) to free up the pp to do so. Alrighty then those look good and that makes sense on burrowing. YEa I can see an argument both ways for tremor sense so might as well leave it as stated int eh House rules and see if we want to revisit that call in the more general sense.